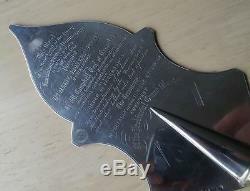 RARE, ANTIQUE, EARLY VICTORIAN, SCOTTISH SILVER MASONIC CEREMONIAL PRESENTATION TROWEL c1853. A rare Antique, Early Victorian, Scottish Silver Ceremonial Presentation Trowel made by A McDonald, Glasgow and dating from c1853. 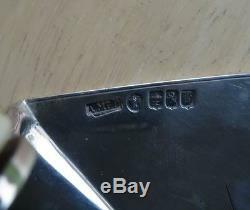 The trowel is hallmarked with the maker's mark "AMcD" for. The monarch's head duty mark (Queen Victoria), the Lion Rampant Scottish sterling silver mark, the Glasgow town mark and date letter "h" for 1852/53. This trowel was presented to a member of an important Ayrshire family. Humphrey Walter Campbell of Crosslet (Sheriff-Substitute of Dumbartonshire). It bears the following inscription. This model of the trowel used at the laying of the Foundation Stone of Dennystoun Dumbarton on 20th May 1853 Presented by Wm. Denny, Ironship Builder, Dumbarton to H W Campbell Esq. Of Crosslet, Sheriff Substitute of Dumbartonshire and Provincial Grand Master for Dumbarton of the Order of Freemasons. As a rememberance of the honor done the Undertaking by the Freemasons and other bodies who took a part in the Ceremony especially of the Highly Esteemed Courtesy of the Provincial Grand Master. The above inscription surrounded by masonic symbols. 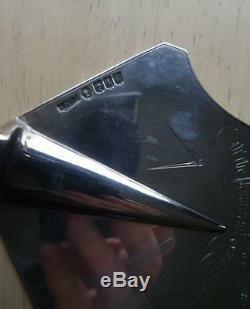 The underside of the trowel also with an engraved masonic symbol. 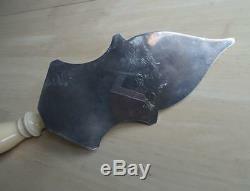 This is a rare and lovely example of a very good quality presentation trowel that is in very good condition. It measures approximately 11 1/2 inches (300mm) in length overall. The blade approximately 7 1/2 inches (190mm). 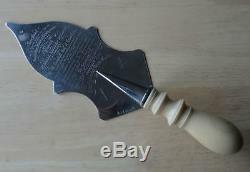 This presentation trowel is one of two related presentation trowels that I currently have for sale. 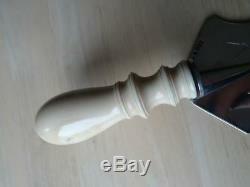 The trowels were presented to different members of an important Ayrshire family; the. Humphrey Walter Campbell of Crosslet, was born at Dumbarton on the 4th of March 1782. He was appointed Registrar of Sasines for the counties of Argyll and Dumbarton in 1810, and was created Sheriff-Substitute for Dumbartonshire in 1820. He died at Crosslet House on the 15th of May, 1864, aged 82. Neil Colquhoun Campbell of Barnhill, was born on the 17th of October, 1813. He was appointed Sheriff of Ayrshire. He married Mary Paterson, daughter of William Orr Paterson of Montgomerie, Ayrshire. He died on the 3rd of April, 1883, and the Barnhill estate passed to his daughter, Annie Colquhoun Campbell. Memorial to the Campbells of Barnhill. Situated at the western edge of Dumbarton Cemetery. Thank you for viewing this listing from. We always have an excellent selection of Pocket Watches and Vintage Wristwatches in stock. We also stock good quality, antique Jewellery and Silver. We trade from the SAAC, Scottish Antique and Arts Centre, Abernyte, Perthshire PH14 9SJ. And be sure to add me to your favourites list. The item "IMPORTANT VICTORIAN SCOTTISH SILVER MASONIC CEREMONIAL PRESENTATION TROWEL c1853" is in sale since Wednesday, November 11, 2015. This item is in the category "Antiques\Silver\Solid Silver\Other Solid Silver". The seller is "deveron_jewellers" and is located in Scotland. This item can be shipped worldwide.